Retail Real Estate – Acres Real Estate Inc. Weather it is neighbourhood shopping centres or regional malls, retail property involves unique challenges in the commercial real estate world. Acres’s experienced retail real estate team of professionals bring a wealth of local expertise and firsthand knowledge to your decision-making processes. This expertise includes all forms of retail, ranging from small unit leasing to street front, specialty retail, commercial condos, enclosed malls or large format retail. Acres’s collaborative, integrated service structure helps ensure consistency and efficiency across your entire portfolio. Our retail professionals provide,transaction services, project leasing, retail tenant mandates, lease renewals, lease dispositions, site acquisitions and dispositions, retail/office condominiums,retail plazas or shopping centres. 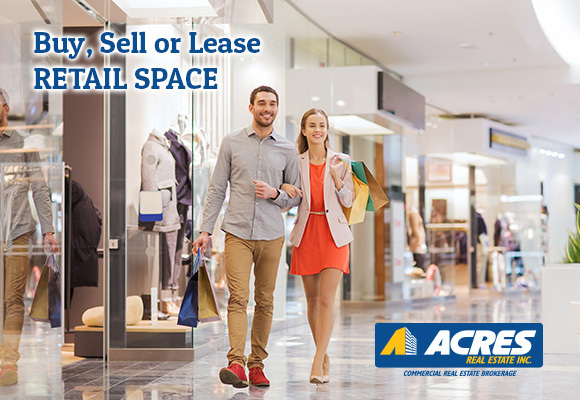 For more information about our retail services in commercial real estate please contact our retail sales and leasing specialist at Acres.